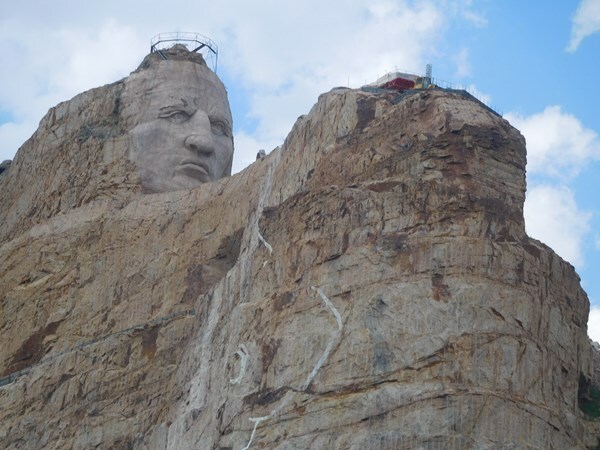 The Crazy Horse Memorial is a mountain monument under construction in the Black Hills of South Dakota, in the form of Crazy Horse, an Oglala Lakota warrior, riding a horse and pointing into the distance. The memorial was commissioned by Lakota Chief Henry Standing Bear to be sculpted by Korczak Ziolkowski. The memorial consists of the mountain carving (monument), the Indian Museum of North America, and the Native American Cultural Center. 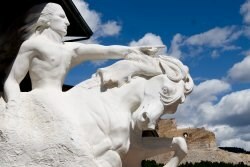 This description uses material from the Wikipedia article on Crazy Horse Memorial and is licensed under the Creative Commons Attribution-ShareAlike License (view authors). 21 people want to do this. 15 people have done this. Visited Crazy Horse Monument as part of a 13 day bus tour. Saw it on the same day as Mount Rushmore. Both are quite impressive and should they ever make real progress on this monument, it will be even cooler than the four presidents. Been working on it since 1948 and his face was complete in 1998. Not much progress since (in my opinion). Still amazing to see. I took the $4.00 school bus ride to get closer to the monument to get this picture. Otherwise you only see his face in full-on profile.